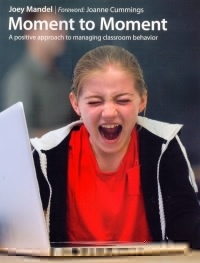 CM Magazine: Moment to Moment: A Positive Approach to Managing Classroom Behavior. Moment to Moment: A Positive Approach to Managing Classroom Behavior. 160 pp., pbk. & pdf, $24.95 (pbk.). ISBN 978-1-55138-287-6 (pbk. ), ISBN 978-1-55138-855-7 (pdf). It is not a supreme ability to teach math or fabulous life experience that makes a strong teacher. The most influential commodity a teacher brings to the classroom is his or her own positive personal qualities and warm character in the face of challenging situations. The individual teacher's daily modeling of an openness to the ideas of others, optimistic attitude, acceptance of all students, tolerance of mistakes, patience throughout challenging moments, and inclusion for everyone may be the strongest teaching tool to help shape positive behaviors in children and influence the way they treat each other and learn. A pro-social teacher is one who understands that she or he plays a crucial role in teaching social-emotional curriculum, then supports and guides that curriculum all day long in the classroom. Moment to Moment is written for all teachers whether they are experienced or new to the profession, whether they are classroom teachers, resource or special education teachers. This book provides educators with explanations, step-by-step procedures and accommodations for a variety of situations and students' behaviours to assist all students in developing and improving their social skills. The Introduction includes four student profiles, two in grade 1, one each in grade four and grade six, that describe student behaviours that many teachers may see reflected in their own students. Mandel's purpose for this book is to provide teachers with information and knowledge that can empower them to identify social and emotional skill deficits students often demonstrate, and then to teach students these skills by using game-based activities. Studying the information will lead teachers to re-examine what they have thought of as misbehaviour and instead recognize it as a skill deficit - a skill which can be taught. Mandel has used knowledge and insight gained by experience as a special education and ESL teacher, a parent coach and education consultant to write an insightful and practical book. The detailed games and activities are meant to include all children in real-world social learning opportunities that help children succeed, instead of allowing them to opt out of activities they find difficult because they have been labelled with Asperger's, or OCD, or ADHD, etc. The initial chapter explains the importance of looking beyond the behaviour, identifying triggers, and breaking down broad ranges of skills into discrete skills. These discrete skills are easy to visualize as they are reflected in the behaviours of the four profiled students. Subsequent chapters focus on developing physical, language, social, emotional, and cognitive skills. A chart to conduct a class skill deficit observation survey is included. The instructions for the games are detailed and easy to follow as they are described in numbered steps, and suggestions for discussion before and after are included. Moment to Moment support for each skill activity encompasses (as appropriate) suggestions for grouping students, working with-in their zone of proximal development, scaffolding, modeling, redo, self-talk, verbal or nonverbal cues, detailed positive praise, and regulating the environment. "Chase the skill" suggestions are included for activities that are suitable to be practised throughout the day. Homework suggestions with wording for a message to be sent home to parents are also part of the plan for some activities. The final chapter guides teachers with steps to deal with meltdowns, to stop their own and the child's escalation, to develop de-escalation skills, and to prevent meltdowns. A list of professional resources for further reading and a detailed index are also included. These real life social skills support children as they arrive at school, move from independent to group work, change classroom spaces, and before, during and after recess. Mandel's goal is to help teachers guide children with empathy and feedback instead of punishment and direction, and she does so with insight and practical wisdom. Betty Klassen teaches in the Faculty of Education in the Middle Years Program at the University of Manitoba in Winnipeg, MB.